I've been doing this tutoring for awhile in the past. I quit doing this due to work busy schedules. Now that I have more free time I am excited to see myself back again here in cclesson. I would be happy to help you improve your english. Let me know how can i help you! I am a Business Management graduate and English is my second language. I was able to know the detail of world wide news! thank you very much for your lesson. Next time also i would like to learn sentenses and pronunciation. It's so interesting and fun to learn about each other's life style real time, and compare notes on some differences. Next time,I will try another destination in Japan. See you soon. Her lesson was sooo powerful. I think she is good teacher. Nice to discuss how we can make the best use of our inherited asset, but because I'm not business-minded, and don't want to bother for asset building, so we disposed of the mother's house. 授業のスタイルなどをはじめに丁寧に説明してくださいました。また自己紹介では自分のつたない英語での話を真剣に聞いてくださりうれしかったです。授業では記事を読んで音読、単語の確認、質疑応答、そして自分の意見を述べることをテンポよく、しかし本当にわかりやすく進めてくださいました。また、発音の訂正も見逃さずにきちんとしてくださいます。とても充実した二十五分間でした。 Thank you for your grate lesson and your comments. I think the way for my future dream is not easy and it's really hard. However, I love studying languages! I will continue to make an effort. I am looking forward to meeting you again! 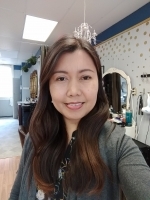 It's quite interesting to know job title and its specific task and responsibility, thus notice difference between our system and yours; the term cosmetologist is new to me. It is OK to me if it is just safe. I am expecting to eat laboratory meat, but still not sure the day comes in ten years. Thanks for your lesson. It's difficult to say. I guess The US need spend money for themselves. For example,public insurance and other services. On the other hand,The US has big power, so they need tolerance for other countries. No wonder I was so confused, I long believed city is bigger than county, for example my college was in Rohnert Park, and my friend lives in Sonoma County,they are close by, and I thought she lives in somewhat rural area. They however are all in the same Sonoma County. Thanks for telling me this. Yes, we did have a nice talk. Thanks! Looking forward to the next session. See you soon. Thanks for your lesson. Today I took a power nap. So I can work hard and study too. At night I hope I will be out like a light. Dear Lynn, it was very nice talking to you, too. It is my pleasure to share each other's life style, culture and thoughts, especially it was exciting to find both of us in California, you now and me before. Thanks and see you soon. Thank you for your kind teaching. Thank you for your lesson. I was a little bit nervous because it’s first English lesson with you. As you say, I will find the lesson interesting and keep learning English! I ‘ll make a booking your lesson as much as possible. I was glad to meet you! See you next time! Have a nice week end! Thank you for the lesson. See you. I think I will try English again in my new year . Thank you too. See you again. Great lesson! See you again. I'm so glad to meet you too. Today's article was intresting. The idea of turning empth properties into green spaces is a wonderful idea. In beautiful open green spaces crime is less likely to occur. What I wanted to say is to keep this kinds of project govermental support is also needed. I get much more motivation for learn English after take your lessons,I will keep learning,see you next time! I enjoyed practice conventions! Thank you ! Thanks!I like your Lesson! See you next! Thank you,the class was fun! I'm sorry to kept you waiting.I'll check what you sent me and prepare the next lesson. I enjoyed it! Thank you for arrange the lessen ! Thank you for your lesson! See you next time! Thank you for your lesson. See you next! I realized I still have to learn English more and more. See you next time! Thanks for your lesson. Although we only practiced self-introduction, but it was very helpful and useful to me. See you next time. I am very happy to meet you. See you next time! Thank you very much for your lesson. See you next time! Nice meeting you,too. I had very good time with you, and see you again sometime. Thank you for teaching me. Sorry about the last night. will book for the next lesson. Thank you. I'll try to do. it was nice time to take your lesson.Pronunciation practice　is good for me. as you said, i would take 1h lesson next time. Thank you for your lesson from the early morning! It was really good Thanks and see you again. Although audio condition was not so good, I enjoyed today's lesson. See you next time. Thank U for Ur lesson.As I said,I'm not good speaker.So I'm looking forward to studying English with U.See U again,Bye! Thanks to your heartful message.See you next weekend! I was able to give lessons in it happily today. Will thank you tomorrow! Thank you always for the wonderful lessons.I want to keep doing my best in class. Thank you for your heartful lesson. You always make me fun! Thank you! See you next weekend! You always gave us creative English lessons.And make me fun. I'm going to keep learning! Maybe....ヾ(＠^▽^＠)ノhahaha! !See you next weekend! I learned how to use past tense, past progressive tense. She always thinks the best way to teach. So every time, she prepares homework and textbook. I do it carelessly to continue it for a long time. Let's do it happily from now on! She was eager to teach. She spoke simple words, and sentences.It's good to improve my conversation skills. Thank you. I learned how to describe the pictures. 3 important things was "learn vocabularies more", "Use my imagination", and "imitate my friend's way". This time the connection was good. see you. Thank you for valuable advice. Because there was not a chance to use English for a long time, I think that it was good to begin a lesson. I think that it is the best method to have now to continue slowly and carefully. Thank you for your heartful lesson and hospitality. I can have the hope that English seems to be able to remember somehow again.I do may best step by step.